Private collection, Paris, from 1890; (Paul Rosenberg & Co., New York); sold October 1958 to Mr. and Mrs. Paul Mellon, Upperville, Virginia; gift 1995 to NGA. Provenance from donor's collection records. French Paintings from the Collections of Mr. and Mrs. Paul Mellon and Mrs. Mellon Bruce, National Gallery of Art, Washington, D.C., 1966, no. 153, repro. Post-Impressionism: Cross-Currents in European and American Painting, National Gallery of Art, Washington, D.C., 1980, no. 126, repro. 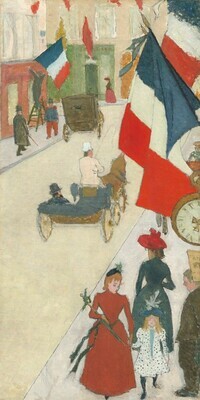 Manet and Modern Paris, National Gallery of Art, Washington, D.C., 1982-1983, no. 92, repro. Kuh, Katherine. "Golden Loans for a Silver Anniversary." Saturday Review (19 March 1966): repro. p. 46.